Drawing of a Buddhist temple near Pashupatinath in Nepal, by Henry Ambrose Oldfield (1822-1871), dated March 1854. The image is inscribed on the reverse: 'No 2. Buddhist Temple, called 'Dundeo' near Pasuputti. March 1854'. The stupa is known locally as Dhando Chaitya and dates from the Lichhavi period, but is possibly of more ancient origin. 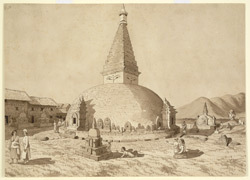 The aritist, Dr Oldfield, was Residency Surgeon at Kathmandu from 1850-1863 and wrote of the temple in 'Sketches from Nipal, Historical and Descriptive...' (1880): "It is dedicated to Adi Buddha, but the date of erection is unknown...The spire was originally covered with plates of copper-gilt, but these were removed at the time of the Gorkha invasion...The temple has no basement beyond a narrow cylindrical plinth, which projects about three feet, so as to form a sort of step or path round the base of the garbh. On this projecting plinth, between the shrines of the Buddhas and their Taras, are numerous carved slabs, on which are figured Buddhisatwas, Siddhas, and numerous designs of chaityas. Numbers of small circular mandals are carved on the flat stone slabswith which the upper surface of the projecting plinth is faced. The toran has the eyes of Buddha on its four sides; and the tall spire, which is acutely pyramidal in shape, is constructed of solid brickwork."